It’s been a few days since North Korea put a satellite into space — a massive technological step for the country and something widely condemned by other countries — but we’re still not much closer to knowing anything about what’s up in space. It only took a few hours for North American Aerospace Defense Command (NORAD), the Colorado-based U.S. Canadian air early warning organization, to detect three new objects in space coming from the North Korean rocket. NORAD later detected a fourth object. The objects have been identified as the Kwangmyongsong 3-2 satellite (the second version of the satellite. The first version was destroyed in April’s failed launch), a rocket booster from the Unha-3 rocket and two pieces of rocket debris. NORAD has also issued data that describes the orbit of the satellite. Using the data, called a two-line element (below), it’s possible for satellite tracking software to determine where the satellite is at any moment. And so trackers, including the N2YO online tracker, are active and can indicate where the satellite is at any one time. This is an important first step for anyone trying to hear any transmissions from Kwangmyongsong 3-2, because it’s only possible to receive signals from the satellite when it’s in range. You can see the area in range at any moment by clicking the “draw footprint” box underneath the N2YO tracker. So, we know where to point an antenna and when to listen, but we don’t know where to listen. The most North Korea has said about the satellite is that it would transmit on 470MHz, but we don’t know if that’s an exact frequency or just an indication of the frequency band. There’s a global frequency band for space to Earth weather satellite communication from 460MHz to 470MHz. Above 470MHz is globally assigned to broadcasting usage, althoug China uses 470MHz to 485 MHz for satellite communications. North Korea doesn’t have such a usage, according to the international frequency band plan from the U.S. FCC. which does list DPRK exceptions in other bands. It’s also not known what the satellite is transmitting — assuming it’s working. The satellite was supposed to have several roles. Kwangmyongsong-3 as an earth observation satellite will assess the distribution of forests and natural resources of the DPRK, the level of natural disaster, the crop estimate, etc. and collect data necessary for weather forecast, natural resources prospecting and others. Kwangmyongsong-3 has video camera mounted on it and will send observation data including pictures to the General Satellite Control and Command Centre. It weighs 100kg and will circle along the solar synchronous orbit at 500km high altitude. Its life is two years. – KCNA report in March. That was earlier this year. After this week’s launch, North Korea has said just one thing about its transmissions. The satellite is now airing ‘Song of General Kim Il Sung’ and ‘Song of General Kim Jong Il’. — KCNA, December 13, 2012. That mirrors claims the state media made back in 2009 when North Korea first claimed to launch a satellite (something that was widely thought to an unsuccessful launch attempt). It is sending to the earth the melodies of the immortal revolutionary paeans “Song of General Kim Il Sung” and “Song of General Kim Jong Il” and measured information at 470 MHz. By the use of the satellite the relay communications is now underway by UHF frequency band. — KCNA, April 5, 2009. But it’s also something that the DPRK never mentioned when talking about Kwangmyongsong 3-1, the first version of the satellite, back in March. Of course, it’s possible the payload has changed, but if so it’s an interesting change. To-date, no one has reported hearing anything that could be coming from the satellite. No music, no data, no telemetry. Nothing. It could just be taking time to discover its frequencies. It’s a slow job because the satellite is only in range of any point on Earth for a maximum of about an hour a day, and that’s split into several passes of about 10 minutes long. But as the days go on, it will become increasingly likely that the satellite has malfunctioned in some way. 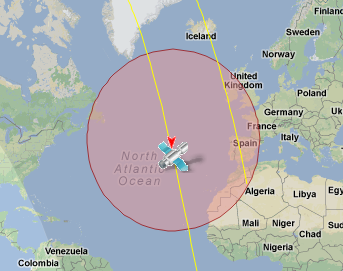 17 Comments on "Tracking North Korea’s satellite"
Do you have a recording? How did you determine it was from this satellite? And was the frequency dead on 468MHz? Another ham radio operator 60 miles from me, and myself monitored the band last night also. My squelch was broken by a faint signal as the satellite approached from the southern sky. It stopped on the following frequencies, each for a short time before moving on. The patterns of squelch breaks made me think of the doppler effect a SAT would produce if the freq was shifting as it was moving toward me. 469.725, 469.675, 468.6875, 468.3375, 468.025. Notice how freq shift went up. Once the SAT footprint was gone, no more squelch openings happened there. Unknown if it was actually the SAT or not. Please provide your exact location, precise date and time of the observation, and precise frequency, it will help determine what you received. The ‘observation’ as it stands is of no use. From your approximate time and assuming you mean Dec 15, 0234 UTC, Kwangmyongsong 3 was passing over Antarctica at the time. I have not heard anything here in Santa Fe Tx…Listened every pass since launch. I can cover 136-502 mhz consistently. Antennas are some omnidirectional circular polarized more or less unity gain and directional helicals. I’ll try listening on the frequencies mentioned above next pass here. The Doppler shift at this frequency and the orbit of KMS 3-2 can be maximum +/- 10 kHz. So Mikes observation is not a satellite. As someone pointed out, that’s much too wide for doppler shift. In Northern California, where I am located, there are other allocations within the band so sometimes data transmissions from other sources are heard. I’ll keep monitoring, but nothing so far. A number of us in Europe and USA have been monitoring each pass of KMS3-2, covering approximately 400MHz to 500MHz. So far there have been no signs of any signals being detected, only a Russian hamsat sending CW around 420.075MHz and ARGOS payloads on met-satellites at 465.987MHz +-. We have the #HEARSAT IRC channel where we’re coordinating our searches for any Kwangmyongsong-3 downlinks. Our IRC channel is registered on starchat.net if you would like to join in the tracking efforts. Once the satellite has been stabilised, attempts will be made to track and detect the X-Band downlinks too. We’ll of course keep monitoring every pass where practical. Thanks for that news Paul. Listened to 470 MHz during early pass where CO was within some radio path, if not best. Figured would try with light on solar panels, if that made difference. Here is report. Acquired faint 1040hz tone at 0816hrs local, progressively got stronger but still very faint, then weaker with following changes. What did the center frequency appear to be? 470.000? I too was wondering about sun on the solar panels, especially with late day passes happening in darkness during these months. The freq was 470.000, but similar signals appeared this evening when the satellite was not in range. This is probably and indication that the original capture I made this morning was something other than the Kwangmyongsong 3. Darn, wish it would have been… but I will keep searching. My apologies for posting here almost 2 years after the last but I was wondering if anyone ever did receive a signal from KMS3-2? I noticed that Robert Sharpe claimed to hear weather data on 468MHz and so for some reason decided to see If I could pick up anything today. Now I don’t want to kick off something that I cannot prove entirely but at around 20:15 UTC 25/05/15 I may have heard something on 468MHz. It wasn’t music, but It may have been data or telemetry data. I tried to record it but my video camera interfered (Completely cut out this frequency) and by the time I had got my recorder the ‘data’ was no longer audible. I’ll try my best to explain what I heard; I believe I heard what sounded like a CCW/CW transmission, nothing advanced like BPSK, It may even have been RTTY but It’s hard to tell. I switched over to 470MHz to try and hear anything there, towards the end of the pass, again I can’t be sure, heard something. It’s hard to explain, I may have heard a faint voice although I’m not sure. I may just have been hearing things, that’s often the case when listening to static for a while but It would be nice if anyone could debate what I heard. Again my apologies for starting this discussion again but I just wanted to explain it.